Step up to the perfect bike and continue the journey of earning victory after victory. 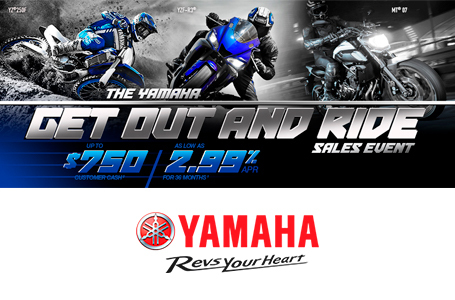 The YZ85 has all the lightweight, 2‑stroke reliability and agility you've come to expect from Yamaha. L x W x H: 71.7 in. x 29.9 in. x 45.1 in. 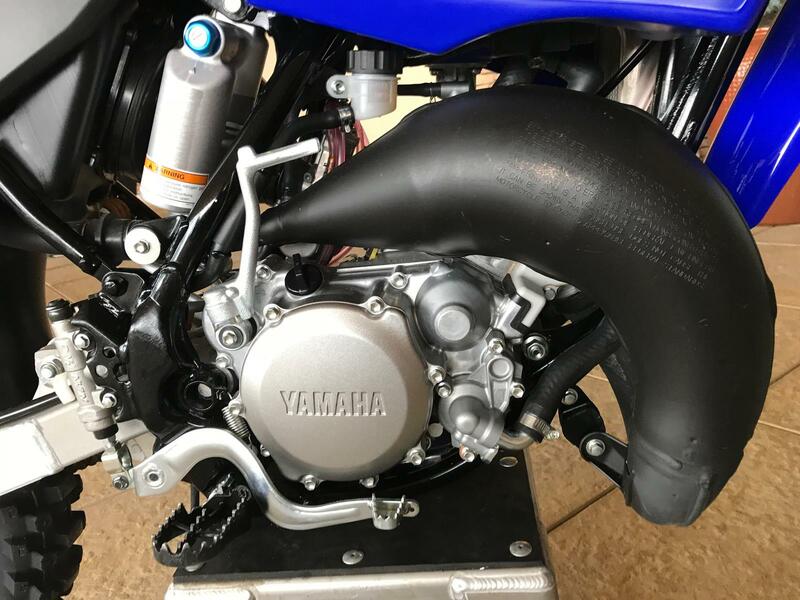 New 85cc YPVS Two-Stroke Power: The 85cc liquid-cooled, two-stroke engine now features the Yamaha Power Valve System for broad, tractable power across the rev range without losing peak power at high rpm. Fully-Adjustable Fork: Lightweight 36mm KYB® inverted cartridge fork features 10.8 inches of travel with compression and rebound damping adjustability with low-friction outer tubes and internals. Upgraded Wheels and Brakes: Lightweight 17-inch front and 14-inch rear rims are durable and reduce unsprung weight for optimal suspension performance, big 220mm and 190mm disc brakes for precise control, and new Dunlop® MX3S® knobbies for exceptional traction. New Adjustable Rider Ergonomics: New four-position adjustable handlebar mounts and taper-style handlebars allows the rider to tune the handlebar position to suit their size and preferences. All-New for 2019! 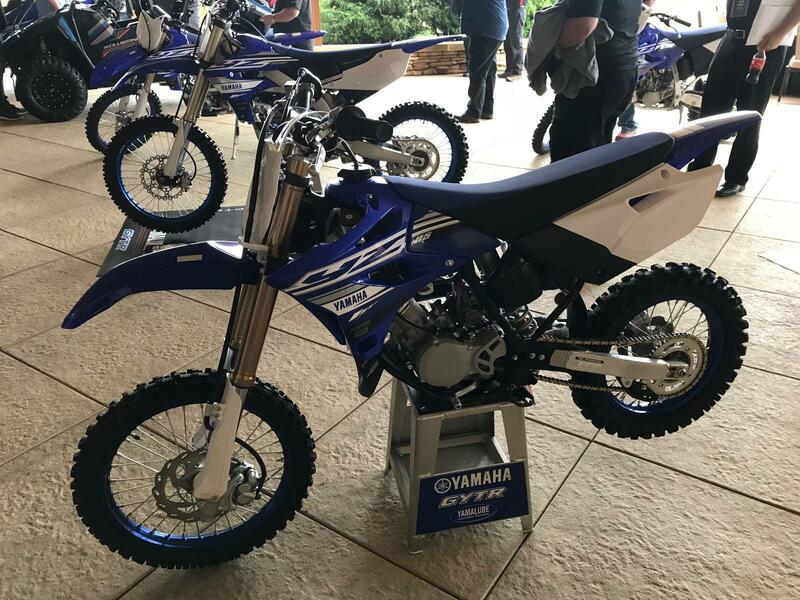 : Redesigned from the ground up, the new YZ85 has been built to dominate the 85cc class with a new YPVS® power valve-equipped engine complete with revised intake, exhaust and transmission. 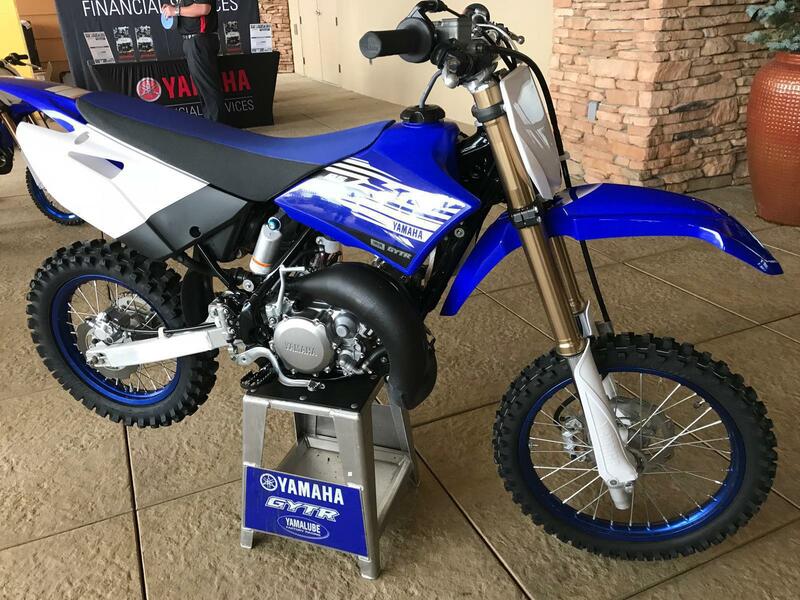 Upgraded Chassis: Featuring new front forks, a new swingarm, new wave-style brake rotors, adjustable ergonomics and more, the 2019 YZ85 is ready to win races straight off the dealership floor. All-New YPVS Two-Stroke: The 85cc liquid-cooled, two-stroke engine now features the Yamaha Power Valve System for broad, tractable power across the rev range without losing peak power at high rpm—improving driveability and reducing the need for frequent shifting. A new head and longer connecting rod design work together to boost compression ratio for enhanced power output, too. New Crankcase and Intake: A new crankcase design features a spacer-style reed valve intake for improved gas flow, which inhales through a 28mm Keihin® flat-slide carburetor for seamless throttle response. New Expansion Chamber: Matched to the improved output of the YPVS engine, the new expansion chamber optimizes exhaust gas flow for enhanced power delivery, especially in the low- and mid-range. Fully-Adjustable Fork: Lightweight 36mm KYB® inverted cartridge fork features 10.8 inches of travel with compression and rebound damping adjustability with low-friction outer tubes and internals. For 2019, one-piece outer tubes and new settings offer enhanced performance across a range of conditions and rider abilities. New lower fork guards provide protection and modern styling. New Swingarm Design: Redesigned swingarm features a new composite chain guide as well as updated chain adjusters for easier maintenance. Upgraded Brakes: For 2019, a new front brake line improves braking feel, while wave-style brake discs offer improved self-cleaning and cooler-running performance. The 220mm front disc and 190mm rear disc deliver strong, precise stopping power. High Performance Tires: New for 2019 are Dunlop® MX3S® knobbies that provide exceptional traction on a variety of tracks and terrain. New Adjustable Rider Ergonomics: New four-position adjustable handlebar mounts and taper-style handlebars allows the rider to tune the handlebar position to suit their size and preferences. The flat fuel tank, radiator shrouds, side panels and rear fender provide generous freedom of movement.